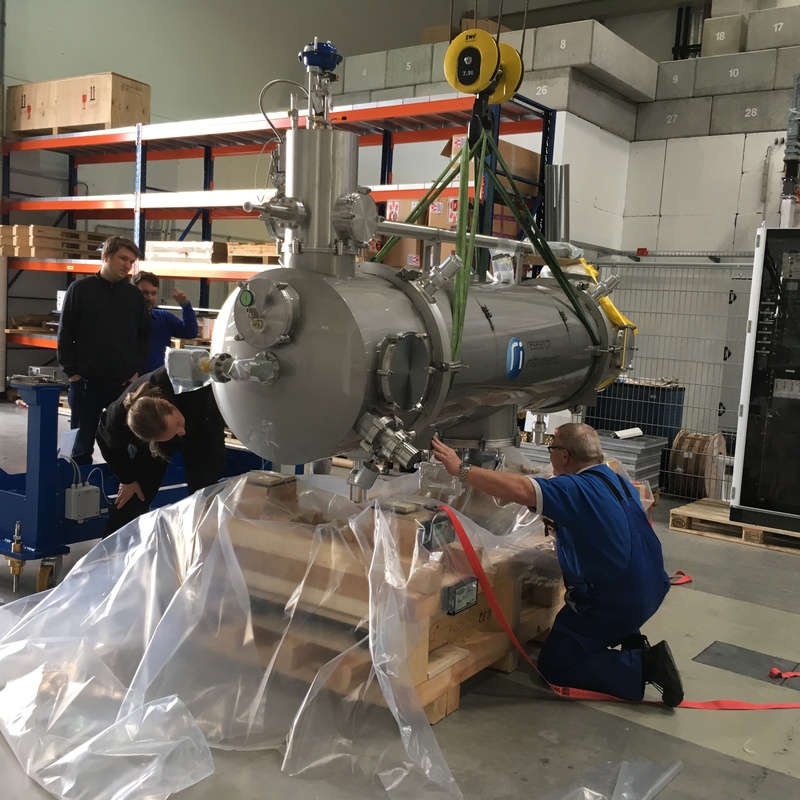 This March and May the two cryomodules for the new MESA energy-recovering superconducting electron accelerator arrived at the JGU Campus. The centerpieces of the accelerator with a total value of almost EUR 4 million were transported to the main hall of the Helmholtz Institute Mainz (HIM) without incident. Testing can now begin in the specially equipped laboratory area at the HIM. The precious cargo had been eagerly awaited for some time. "We’re in business!" came the rallying cry from Timo Stengler of the MESA-team led by Professor Kurt Aulenbacher, as he donned his protective gloves. After a few minutes, the tarpaulins on the delivery trucks were opened to reveal one of the MESA centerpieces, which in comparison to similar accelerator components is almost "delicate." The cryomodule is approximately the size of a small car and has a similar workaday gray metallic finish – except that the purchase price is on a completely different scale. This is due to the sophisticated technology inside: each of the modules will supply an electrical potential of 25 million Volts (almost one hundred times greater than a high-voltage overhead power line), which boosts the kinetic energy of electrons to 150 mega electron Volts after three circuits of the two modules. In addition to its compact design, the novel energy-recovering technology will distinguish MESA as one of the most powerful accelerators in the world. Aulenbacher seemed pleased with the smooth delivery of the equipment. "We know what it is capable of," said the now noticeably relaxed group leader. "Now we just need to see if the component also meets our expectations in actual operation." The test phase of the modules will last approximately two months. Both modules will then become working components in the overall structure of the new MESA accelerator. The commissioning of the new accelerator is planned for 2021. 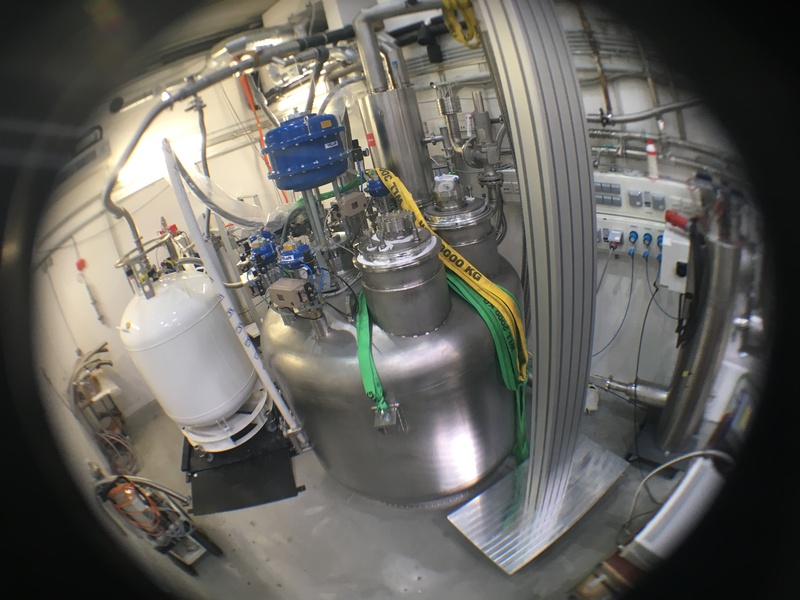 MESA is the world's first energy-recovering, superconducting accelerator which will be used for research purposes. "With its high beam intensity and quality, MESA offers unique conditions for a future-oriented program of experiments to study and test the limits of known phenomena in elementary particle physics, which is one of the core research objectives of PRISMA," says Aulenbacher. The development and construction of MESA is financed from resources of the PRISMA Cluster of Excellence. Das Modul wird mit dem Deckenkran von der Transportvorrichtung gehoben. Sensoren an der Halterung haben alle Erschütterungen während der Fahrt nach Mainz aufgezeichnet, sodass eventuelle Schäden nachvollzogen werden können. Das Innere des sogenannten „Testbunkers“ im HIM. Hier werden die Kryomodule jeweils einzeln nacheinander getestet. Die Tanks im Hintergrund enthalten flüssiges Helium, das zur Kühlung der Kavitäten auf ca. -271 °C in die Module gepumpt wird.